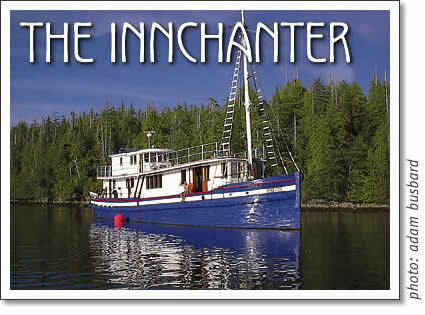 Twentyseven nautical miles northwest of Tofino tucked in picturesque Hot Springs Coves sits moored the Innchanter. The 86 foot former coastal packer isn't there waiting for its next assignment hauling cargo or seafood, she sits there with her owner Shaun waiting for their next guests. Together they've created one of the most unique holiday destinations imaginable. The 210 ton aft cabin freighter has served many purposes since she was first built in New Westminster many years ago but now as a 5 room bed & breakfast that she has really come into her own. When Shaun bought her she was still set up as a work boat and he has spent the last 7 years converting her into the cozy space that she is. Complete with a fireplace warmed living room, forward cabin library and intimate dining room she offers a comfortable environment to get away form the norm. Shaun began his career as a host many years ago when he ran a hostel in Northern Scotland. He came into this position during 12 years of extensive traveling throughout the entire world. It was the love of travelling and meeting people from all corners of the globe that helped Shaun decide that he was meant to be an innkeeper. When Shaun came back to Canada he said that he went looking for a place with magic and beauty to set up and Hot Springs Cove had it all. Highlights of Shaun's hospitality include great travel stories and tales, gourmet dinners and breakfasts, an extensive literary and artistic collection, decadent linens in the rooms and the hot springs just around the corner. Staying at the Innchanter has elements of roughing it that may not appeal to all travellers but for those that are looking for something new and different it is well worth the trip. Tofino accommodation: 27 nautical miles northwest of Tofino tucked in picturesque Hot Springs Cove sits moored the Innchanter.